Why do we keep on making the same mistake, even when we know the correct note? Learn how to practice piano more effectively here. Sitting with correct posture when playing the piano can mean the difference between painful or effortless playing. In this beginner piano lesson you will quickly learn to read piano music.You need basic understanding like up and down on the piano, finger numbers, and knowing the note names. Reading music notes can be easy! In just two easy and totally free piano lessons, you will be reading music and play with both hands in no time! Starting to play the piano as an adult can feel like swimming against the stream. Aren't you supposed to be very young to begin piano lessons? Isn't it too late? The fact is that you can start learning anything anytime in your life. True, it is also a fact that up to a certain age, our neurons are hard wired to slurp up new knowledge like a sponge. This is why it is easier in some ways to learn to play from a young age. It is also true that since learning the piano to a very advanced stage takes many, many years, usually over 10 years of hard work, it is an advantage to start young. But, this is assuming that you want to become a professional and highly competitive pianist. If you just want to learn to play the piano, even to an advanced level, age is no limit. However, beliefs are limiting, unfortunately. You need to equip yourself with courage and the true belief that you can learn to play the piano at any age. Fortunately, times are changing and we see more and more adults either returning to the piano or starting fresh. If this is you, you can proudly think of yourself as a pioneer, and an inspiration for others to do the same! Get a good instrument. Before you start piano lessons make sure you have a piano. Don’t expect your piano teacher to find one for you. 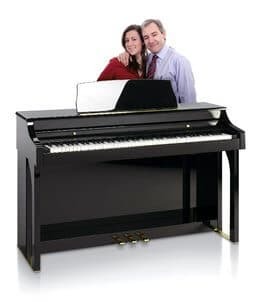 Piano teachers are usually not specialists in purchasing a piano, and waiting until you have started piano lessons to get help from your piano teacher will only delay the learning process further. Go to a good piano store and have them work hard for you! They are the specialists. Let them show and play the best instrument for you. Then as you mull it over, check for reviews online for example. You will also need a comfortable piano bench and a metronome. Usually a piano lamp is a good idea as well. Find a piano teacher who works with adult students. Teaching adults is not the same as teaching children. You will use different materials, methods and approaches. You’ll also want someone who talks to you like an adult. Create a piano music haven in your house. Make a corner of your living space a place where you can work undisturbed for as much time as you can and want. Depending on your space, use a carpet under the piano, curtains and/ or other textiles to reduce harsh sounds. Schedule a time when you will indulge in your new endeavor. Put a reminder in your calendar and stick to it. Practicing the piano for 30 min a day or so, is a good habit for adult beginners. It includes listening to recordings, reading music, playing scales and exercises, and of course learning piano repertoire.